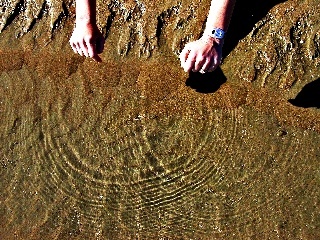 When you throw a stone in a quiet pond or dip your finger in a puddle, a nice circular wave emerges on the surface of the water. It gently moves across the pond in a concentric pattern (see photo). Physicists call these ripples "surface waves", because only the molecules in the top few inches of the water are being moved by such waves. The deeper you probe the pond, the less effect such waves have. Already a foot or so beneath the surface, the water stays completely calm as these waves pass overhead. 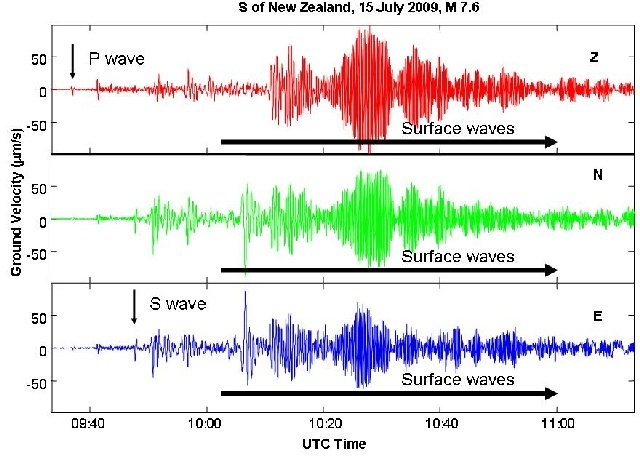 A very similar pattern of waves follows every earthquake. When the Earth moves in a temblor, it generates more than just the P- and S-waves we described a while ago (see blog September 10, 2008). Surface waves also emerge, but unlike their relatives on the water surface of a pond, they can be anything but subtle. Take the strong earthquake which happened last night (Pacific Daylight Time) off the southern tip of the South Island of New Zealand. Although it had a magnitude of 7.6 and was located just 20 miles beneath the surface, it caused surprisingly little damage in New Zealand's coastal towns. But even though the quake's hypocenter lay all the way across the Pacific, it made the ground in Berkeley move by 1/10 of an inch. The blogger doubts that anybody would have felt this swaying of the ground, because the period of such surface waves from far away earthquakes is 20 seconds or more. As you can see in the seismogram, it took more than an hour for all the surface waves generated by the New Zealand quake to pass California. Fig 2. Seismogram showing P, S, and surface waves from the magnitude 7.6 New Zealand event recorded at station BKS. In contrast to their relatives in the pond, these seismic surface waves did not travel across the surface of the Pacific Ocean. They traveled along top layers of the Earth's crust, and during their journey they don't care if the rocks are hidden under water or exposed on a continent. The seismic surface waves spread as elastic waves through the crust in the same pattern as the water waves on a pond.